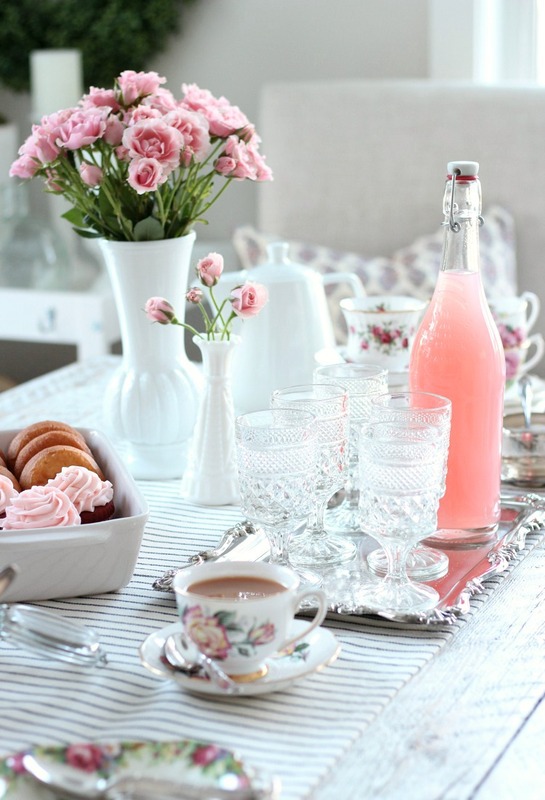 Invite your girlfriends over for a GALentine’s Day tea party. 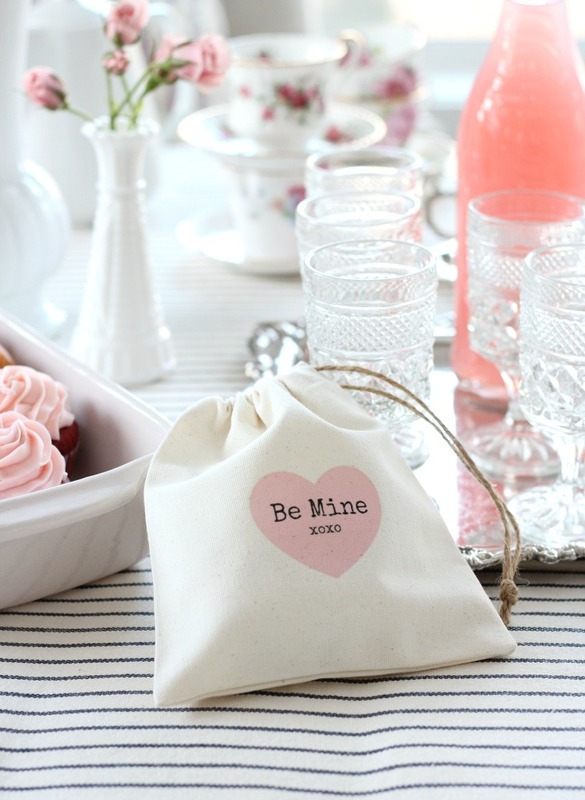 A good excuse to pull out your pretty vintage tea cups and enjoy some delicious Valentine treats with your besties. Being a lover of vintage decor, it’s probably no surprise to you that I look for any (and every) opportunity to put my collections to use. 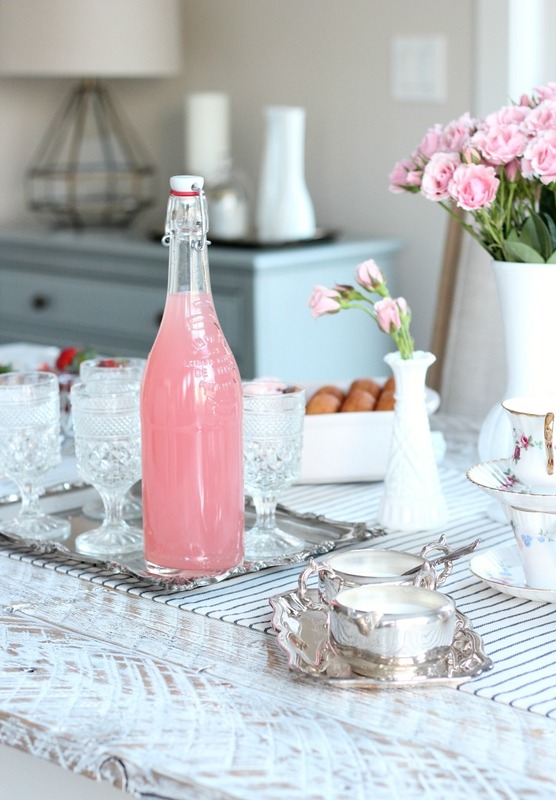 When I started thinking about Valentine’s Day a few weeks ago, I was inspired by my vintage tea cup collection to do something a little different this year and host a GALentine’s Day tea party. Sounds pretty fun, right? Although I try to meet up with friends for coffee or lunch every other week or so, quite often time slips away on me, and a month or more can pass by. Most of us lead busy lives, but I guess you could say I’m working on shifting my priorities to better align with my values. I mean, who fully understands our struggles better than our closest girlfriends? So, at the beginning of this year, I decided to create more meaningful moments like these by planning and hosting small get-togethers. Nothing big that causes additional stress in my life. Just a handful of us gals gathering together to uplift, support and, most importantly, laugh. It’s the best therapy! 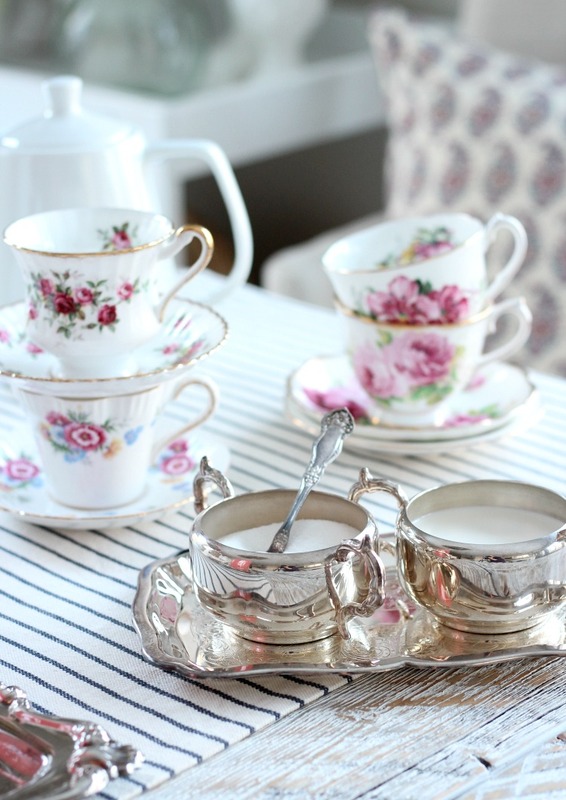 My grandmother’s tea cups were my jumping off point, so the rest of the decor (style and colours) stemmed from there. Find something that inspires you and run with it. 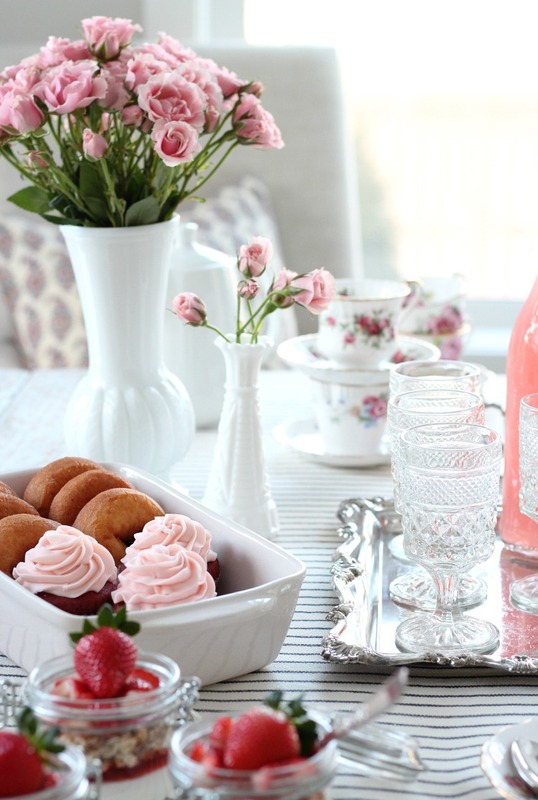 For a budget-wise party, base your theme around what you already have on hand. For instance, I only bought fresh flowers and a pattered pillow cover (that I planned on buying anyway). I “shopped” my house for the rest of the decorations. Be sure to look in cupboards and closets first before you purchase anything new. Then, start gathering items in one area to see how it’s all coming together and where you may need to fill in. Be creative! When it comes to planning parties, lists are your best friend. Shopping List- This is where you transfer the “What You Need” items from your other lists. At least a week or two ahead, decide on a time and date that works best for you, as well as most of your friends. (Galentine’s Day is “officially” celebrated on February 13th as started by Amy Poehler’s character on Parks and Recreation). Remember, it’s often difficult to accommodate everyone, so don’t stress if one or two can’t make it. Simply plan a coffee or lunch date to catch up at a later time. Paper invitations are always beautiful if you plan many weeks ahead, but for small parties like these, I often use online invitations such as Paperless Post. Set an RSVP deadline you’re comfortable with (I prefer to have confirmations at least 5 days before the party). I pick up as many supplies as I can while doing my regular shopping and errands the week(s) leading up to the party. That way, I’m not rushed and can usually find budget-friendly items at thrift shops (my favourite), dollar stores or Michaels (with a coupon) depending on my theme. Depending on the decor, you should be able to set everything up the night before (or early morning). 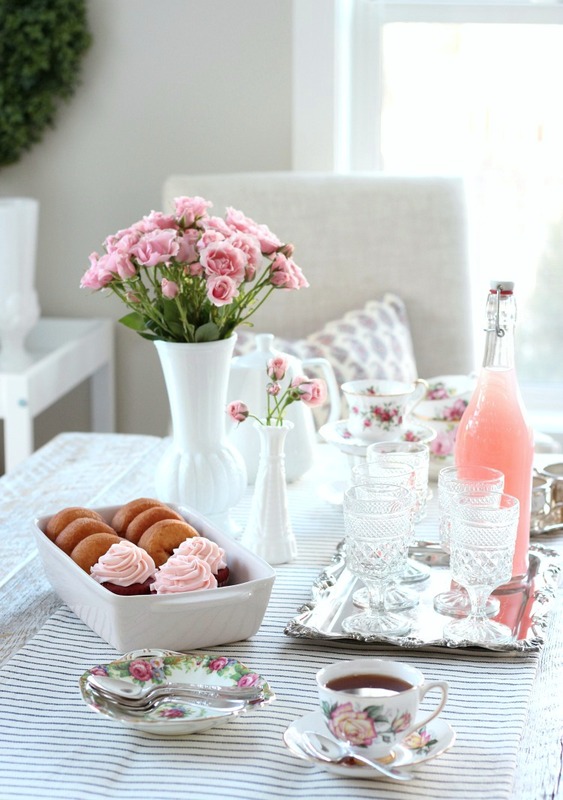 For my tea party, I arranged the pink spray roses in vintage milk glass vases and placed the dishes in a way that looked pretty and made sense. I even set out the serving dishes and trays I planned on using for the food. My advice is to keep this part as simple as possible. Since my party was planned for mid-afternoon, tea (and coffee) were the focus with a few Valentine’s Day sweet treats. All I had to do was put together the yogurt parfaits in the morning and chill the pink lemonade. 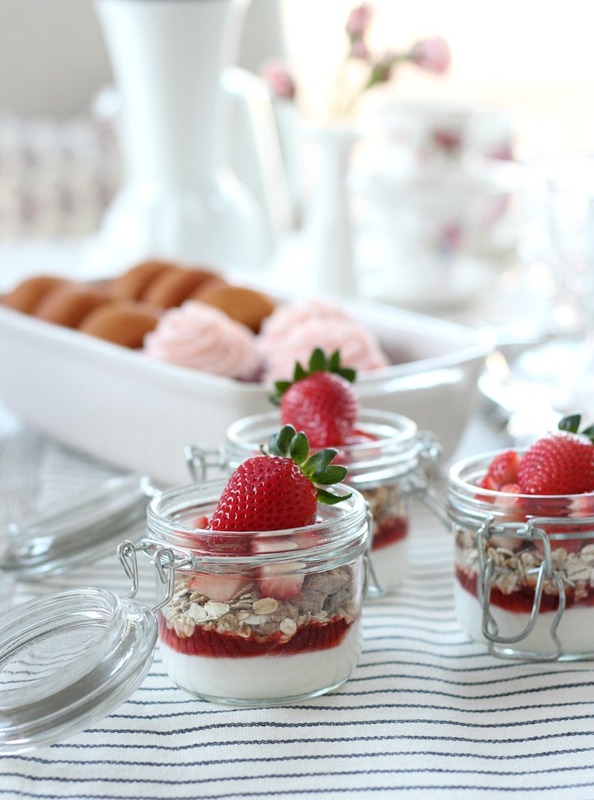 Right before my guests arrived, I filled the sugar and cream dishes and transferred the baked goods. I also made sure I had my tea kettle ready to go along with an assortment of teas. Then, I made a pot of fresh coffee for my non-tea-drinking-friends. It’s also fun to put together some Valentine’s Day Party Favours to hand out to your gals as they go. For these, I printed some cute little hearts on canvas bags using iron-on transfer paper. Then, I filled them with sugar scrub, nail polish, heart-shaped truffles and lip gloss. Cute, right? What would you want in yours? Have any other Galentine’s party ideas? Looking for other Valentine’s or GALentine’s Day Ideas? 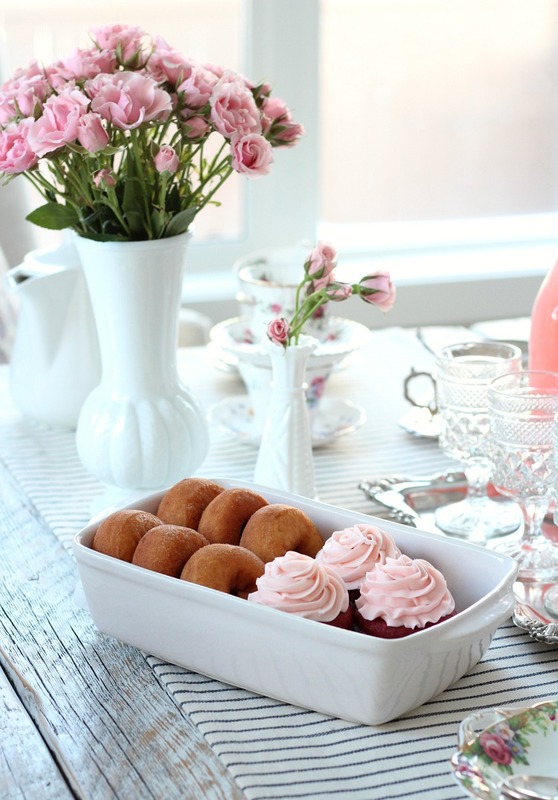 Such a pretty tea party Shauna! So inviting! Pinned! 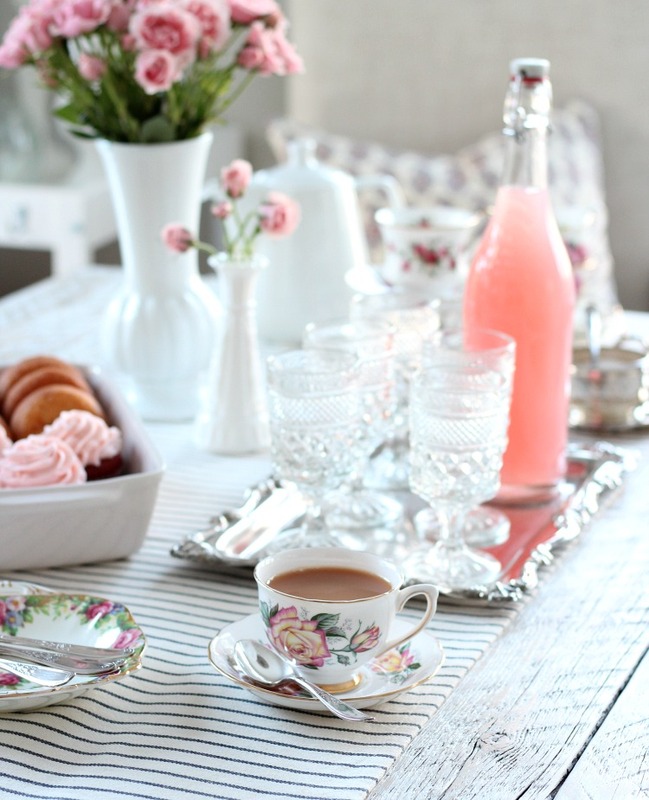 I am totally inspired to pull out my vintage tea cups and pick up some little pink roses. What a lovely idea. pinned. What a sweet party Shauna! I love the idea of celebrating Galentine’s Day with close girl friends…a perfect reason to get together! Oh, this is adorable!!! 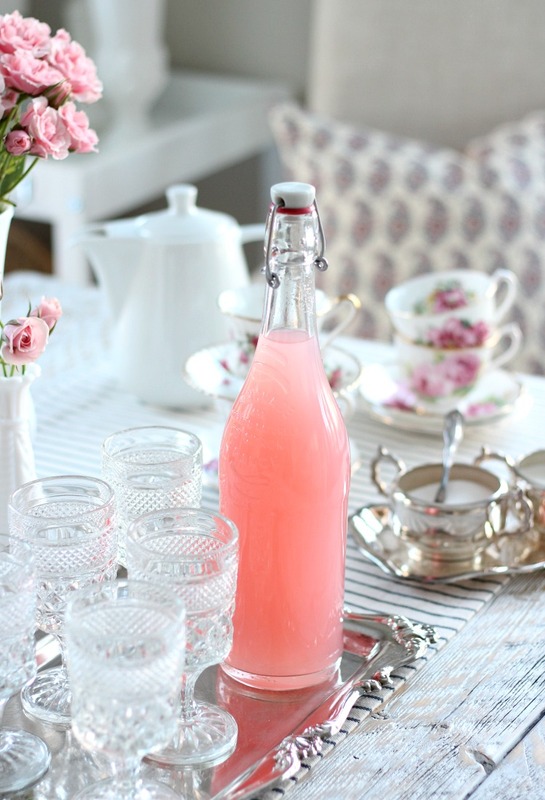 I love the way the table looks with the pink drink and the pink floral dishes- gorgeous! So elegant and beautiful Shauna! 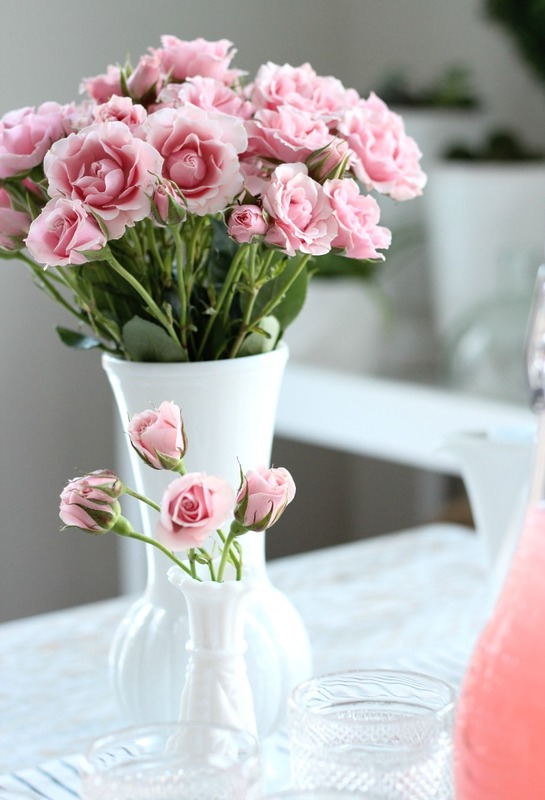 The flowers, treats and your glassware are all stunning! 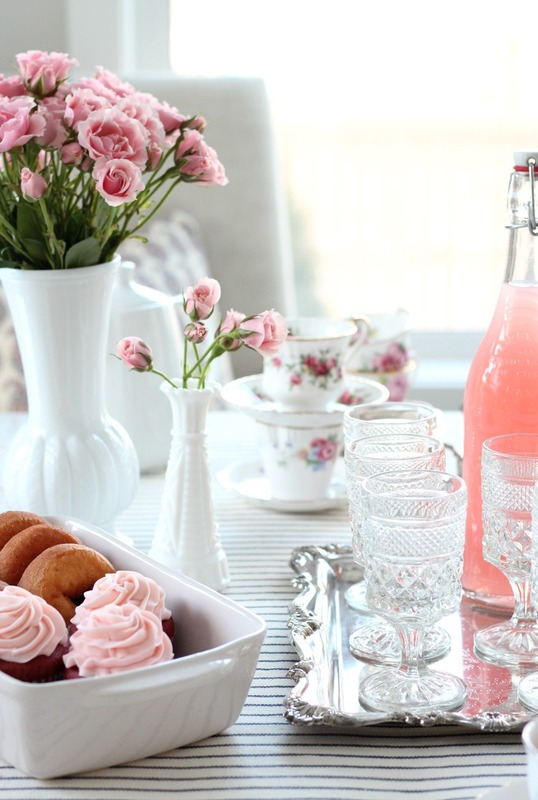 Love your vintage tablescape, it’s all beautiful . This is so beautiful in both appearance and sentiment. Valentines can make single women feel left out and this is a beautiful way to include them. This is beautiful and I love what you said… shop the house! Totally economical and stunning! Shauna your party looks like so much fun. The decor is so beautiful. I love the idea of making time for more simple get togethers, thanks for sharing this one. What an elegant table! Where did you find the glass lemonade bottle? The “shop the look” link took me to a square bottle. Just wondering. Again, absolutely fabulous! Love this party decor and that tablescape! Just lovely, Shauna! So excited that you will be one of our first features at Homestyle Gathering! Hi Shauna! I love so much about this tea party! I wanted to let you know that I featured you over at Homestyle Gathering. Thank you so much for joining our party. We hope you’ll join us again this week.